Today Spick and Span window cleaners went to Camberwell and cleaned a glazed side- return that stretches the length of the property, covering the hallway, bathroom and kitchen. 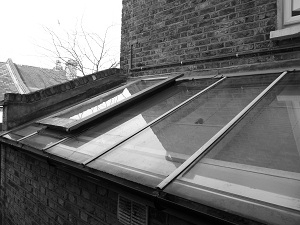 The side-return extention was accessed using a ladder, and the dirt that rested upon the glass roof was aggravated using a dirt loosening detergent and scrubbed with a microfibre pad. The loosened dirt was directed away from the glazed panel with a squeegee and blade, this same method was used to clean the windows and doors surrounding the kitchen extention and the windows of the house.